Times have changed and winds have shifted, but the Palace On Wheels cruises along in its unique style, the kind only the Maharajas of yesteryears could have perpetuated and enjoyed. Today, of course, eac h traveller on board is treated like royalty in his or her own right. The exquisite & exclusive Palace on Wheels has luxurious cabins, wall-to-wall carpeting, a well stocked bar, two dining cars, and a very personalised service. Infact everything that could comprise of heaven on earth for a whole week. The festive fervor of Christmas catches up even amidst the sandy and earthy terrain of Rajasthan while you are aboard the Palace-On-Wheels. All passengers sing dance and make merry within the comfortable confines of the train. When the music is pulsating and spirits soaring, it is difficult to keep in control and you tend to go with the flow. 1645 Hours: Report Delhi Cantonment Railway Station and board on Palace On Wheels, The Maharaja train tour. The journey of a lifetime begins at the Delhi cantonment station where the guests are accorded a warm, traditional welcome before the palace-on-wheels pull out into the night. 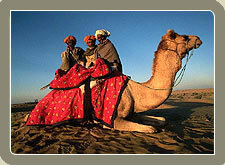 For a week long luxury cruise through fascinating Rajasthan. 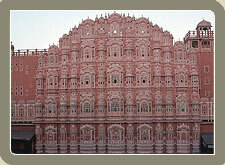 When you reached at Jaipur, a gala reception awaits you at the Pink City. With traditional Indian music of the shehnai, playing in the background, you will be welcomed like a Royal Celebrity. And why not.... this is the first stop of the Palace on Wheels in the land of Maharajas, magnificent Palaces and impressive forts. And this is just the start; from this time on, every moment that you spend on the Palace On Wheels will leave memories that will last for a lifetime. To explore the city, an air-conditioned coach takes you to Hawa Mahal or the palace of winds, which is a remarkable five storeyed building along the main street of the old city in pink splendor with semi octagonal and delicate honey combed sandstone windows. This is followed by a visit to Amber Fort, 8-km away, where rides on caparisoned elephants add to the ambience. And yes, how can you miss the shopping in your Jaipur tour. Jaipur is the place to shop until you drop ! It has a plethora of handicrafts ranging from grimacing papier-mache puppets to exquisitely carved furniture, jewellery, handicrafts, carpets, blue pottery and textiles. The luxury coaches will take you back to palace on wheels around 6.30 pm. Dinner on board. Welcome to Heart of Thar Desert - Jaisalmer. Founded by Rawal Jaisal in 1156. Sharply etched against the sky, Jaisalmer is a splendid sight with its yellow sand stone walls and bastions that seem to rise from the golden sands. Visit the intricately latticed havelis with their elaborate facades. The superb craftsmanship of the stone carved is illustrated in Nathmalji-ki-haveli, Patwon-ki-haveli and Salim Singh-ki-haveli. After a sumptuous lunch, experience the exhilaration of a camel ride on the golden sand dunes at Sam, the most picturesque dunes. No trip to Jaisalmer is complete without a visit to these fascinating dunes which is followed by evening tea. The Palace on Wheels departs for Jodhpur at night. Welcome to the Blue City - Jodhpur founded in 1459 AD and is the second largest City in Rajasthan. It was also on the ancient Silk route. The formidable Mehrangarh fort, rising as high as man's unflinching will, atop a hill, dominates the city. Umaid Bhawan also known as Chittaur Palace, is another landmark of the region. It was conceived as part of famine relief operations, at the beginning of the century, by Maharaja Umaid Singh. The palace took 16 years to build, and provided employment to the famine stricken. A portion of the palace has been converted into a hotel. After lunch at a Palace hotel, return to the Palace-On-Wheels. While in Jodhpur, shop for exquisite handcrafted articles including the famous breeches, embroidered shoes, metal curios, silverware, paintings and tie and dye fabrics. Excitement is in the air as the Palace on Wheels touches Sawai Madhopur, a city fortified in 1765 and named after its founder Maharaja Sawai Madho Singh I. One can almost sense a life of the wilderness here . After breakfast a visit is arranged to the Ranthambhor National Park, where in are located the ruins of a 10th century fort. This wildlife sanctuary is considered to be the country’s best for observing and photographing the activities of the tiger. The park, covering an area of 392-sq-kms is home to more than 300 species of birds. 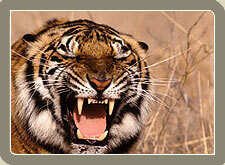 The Tiger, Hyena, Ratel, Jackal and Fox are among those constituting the carnivorous population here. 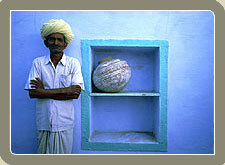 Sawai Madhopur is also known for its exclusive toys, ethnic ornaments and costumes. Upon return to the palace on wheels, you leave for desert citadel Jaisalmer, when one gets an opportunity to watch the colourful countryside passing by the daylight. Lunch and dinner are served on board. Welcome to the 'City of Lakes'. One of the most romantic places in India, it is situated around the shimmering clear blue water lakes, which whisper the mood of a bygone era. Udaipur was founded by Maharana Udai Singh of Mewar, after the Sisodia dynasty was driven away by the Mughals, in 1559 AD. Perhaps the two most beautiful sites of Udaipur are the dream like marble palaces the Jag Niwas (Lake Palace) and the Jag Mandir, which appear to rise from the blue waters of Lake Pichhola. After lunch at Lake Palace Hotel, a visit to the City Palace is exhilarating. After bidding good-bye to Udaipur day of its trip the Palace-on-Wheels arrives at the beautiful Bharatpur. The city of Bharatpur is an Avian paradise and is renowned for the bird sanctuary. So great is the pull of the Keoladeo Ghana Bird Sanctuary, Bharatpur, that people spare not a thought for the state that gave birth to it. This superb waterfowl habitat, one of the finest in the world, was actually created by a Maharaja. Bharatpur, the nesting place for thousands of Egrets, Siberian Cranes, migratory Water Fowl and other species of birds. 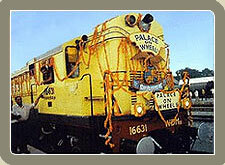 After a splendid visit to the Ghana National Park, the Palace On Wheels arrives at Agra. Where Fatehpur Sikri, the red sandstone Mughal palatial complex. Within the enclosure is a mosque built by the Mughal emperor Akbar and dedicated to Sheikh Salim Chishti, a museum Sufi saint who blessed him with a son. After lunch move on from the red fort and arrive at the Taj Mahal, one of the Seven Wonders of the World. A pristine monument of undying love, it was built by Emperor Shah Jehan in memory of his beloved queen Mumtaz Mahal. Agra is known for its splendid marble inlay work like the ‘Pietra Dura’ work in the Taj, leather goods and jewellery.